Although I love to cook, there are times when I’m just not feeling it. On those days I tend to either snack myself into oblivion or down a protein bar and tough it out until my next meal. Eating well-balanced, nutritional meals makes me happy; and frankly, neither one of those scenarios puts a smile on my face. The people at Good Food Made Simple offer a solution, and I was more than happy to take them up on their offer to send me some samples. 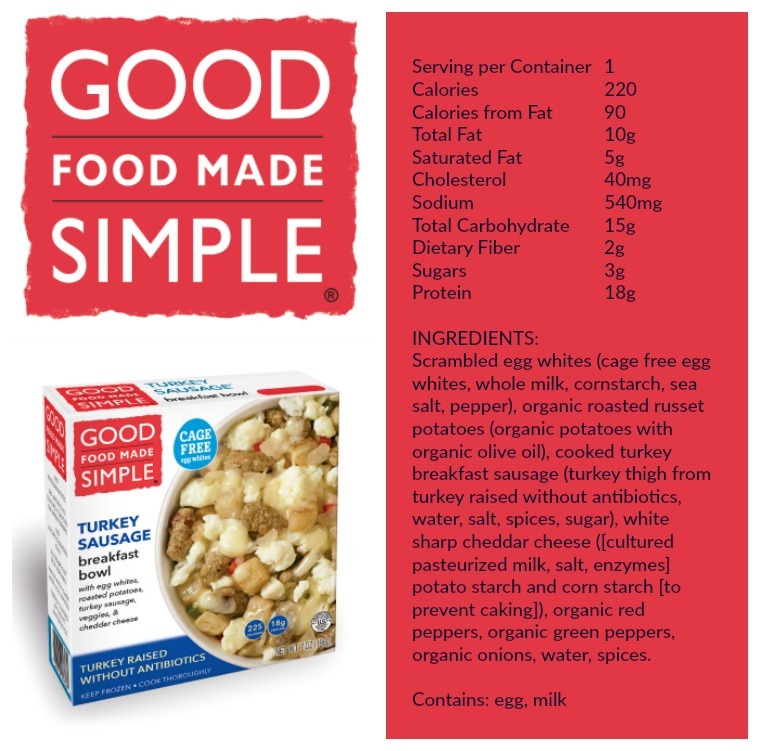 Good Food Made Simple is an all-natural frozen food line made with wholesome ingredients like cage-free eggs, whole grains, antibiotic-free meats and organic vegetables. They don’t use sugar substitutes, hydrogenated oils, GMOs, chemical preservatives or artificial flavors. In short, they use natural ingredients to make simple meals, much like you would at home — if only you were feeling it! If you’re like me, you wouldn’t dream of skipping breakfast, so I really like that they have a plethora of choices for the first meal of the day including breakfast burritos, egg scramble bowls, café wraps, pancake puffs, waffles, and steel cut oats that are ready in minutes. For lunch/dinner they offer six hand-held burritos (flavors include Root Beer Pulled Pork, Buffalo Style Chicken, Meatball Marinara and more) and a dozen chef-crafted gourmet classics like Chicken Pad Thai, Cavatappi Bolognese and Southwestern style Steak and Black Bean over rice. For those of you at home with any food sensitivities, it’s worth noting that many of the options contain wheat and/or milk. Now, I didn’t try everything (there are 42 items to choose from and the company is continually revamping the selection), but the majority of the meals I sampled were winners! Pro: Good Food Made Simple is made for the microwave. Each item is ready in five minutes or less. Pro: They offer interesting combinations and good flavor. Ingredients tasted like they are supposed to. Chicken and steak were tender and vegetables actually tasted like real veggies. Pro: Thanks to a decent serving of protein (14 to 20 grams per serving) and calories (they range from approximately 200 – 500 each) all of the meals kept me reasonably satisfied. Pro: The minimally processed ingredients are nutritionally sound. Con/Pro: The dinner options for vegetarians are limited (at last count only three), but there are quite a few plant-based options for breakfast. Con: If you are watching your sodium intake, read the labels. The amount of sodium hovered around the 600 mark, but occasionally jumped up over 800 per serving. Pro: The price range was reasonable and a lot less then you would spend at a fast food restaurant; $2.50 to $4.00 per item at my local grocer. Best Bang For Your Buck: The Scramble Bowl was a hands-down favorite, especially with my husband. Cooking a similar concoction at home, especially for one, would be labor intensive for sure. 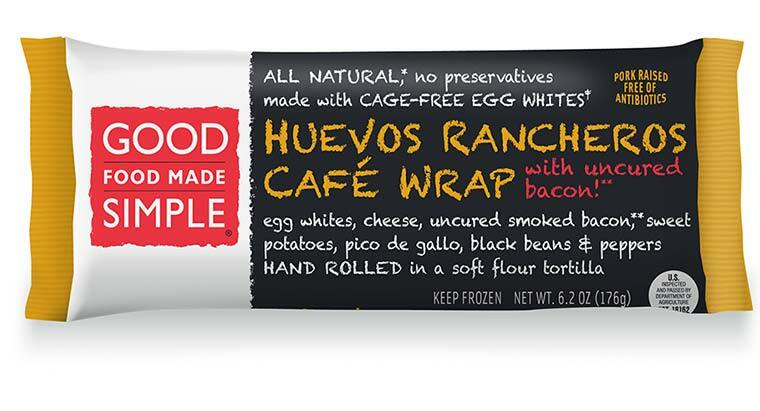 I have to hand it to the Café Wrap as a runner up, though, because the price point is fantastic. I especially like the fact that it could work for a quickie breakfast or lunch. What I’d Leave on the Shelf: The Pancake Puffs were tasty little bites, but a serving of six was in no way satisfying. I had to supplement mine with half a grapefruit and a scrambled egg. And overall, the Turkey Meatball entrée just missed the mark. Fit Bottomed Line: I am a huge advocate for home cooking, but when that’s not possible, Good Food Made Simple’s made from scratch products are a smart choice.